It's been almost two weeks since I've posted and to tell you the truth, I don't have much to show today in the way of stitching. I've been busy working on Meari's mailart and am almost finished it. I made some decisions regarding the granny stripe and quilt. Thank you all for your input and advice. It's so nice to have others put in their opinions, based from experience, which helped me make an informed decision. I decided to rip out the granny stripe and redo. Probably will restart this weekend now that there's been some time in between the ripping. 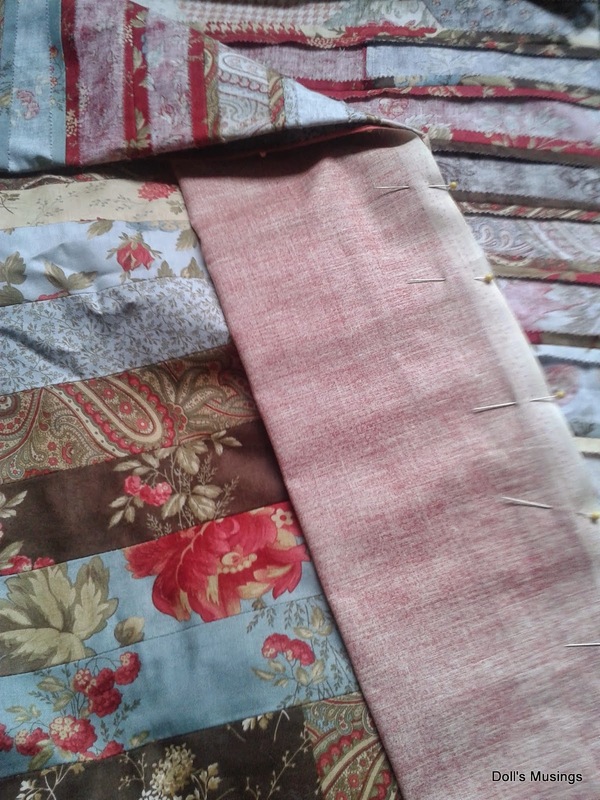 As for the quilt, I will stitch in the ditch for the main parts of the quilt, then hand quilt some sort of leafy, floral design on the red panels with red thread. That way I will not be taking 8 years, ahem Barb!, to hand quilt my first quilt!! Titus trying to help me with quilting...not! Pinned and ready to sew the red panels! I made some minute progress on Magic Garden. Dear Maggee hasn't been very well so I've been trying to put off the finish, which is fine since I have a gazillion other things to do!! I've also worked on JCS a bit and have contemplated starting Sarah Chapple. I wanted to start her on Spring break but forgot! Oops! The peacock is finally DONE! 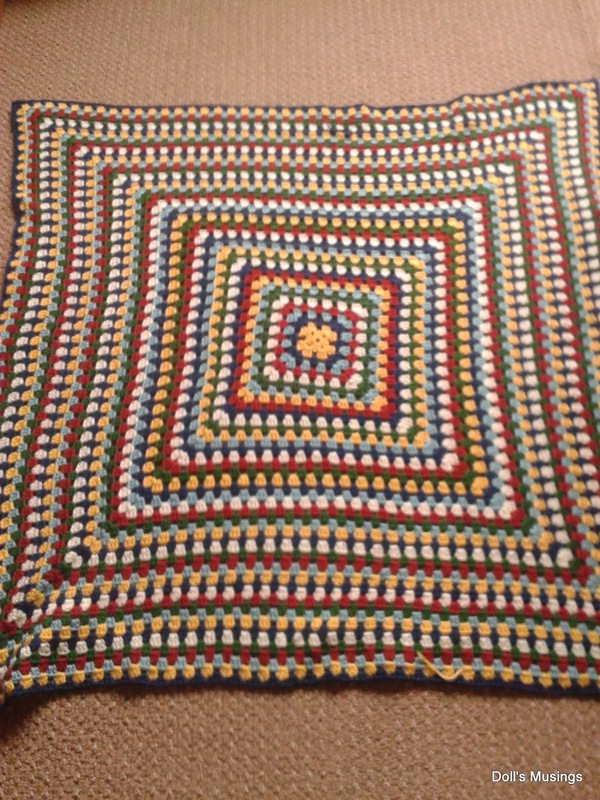 My granny square has grown by 5 rounds. It's taking longer and longer to do each round. I'm hoping that I'll only have to do another 10 or so. Spring is special to all of us. It brings the prettiest flowers and feelings of hope surging through us. 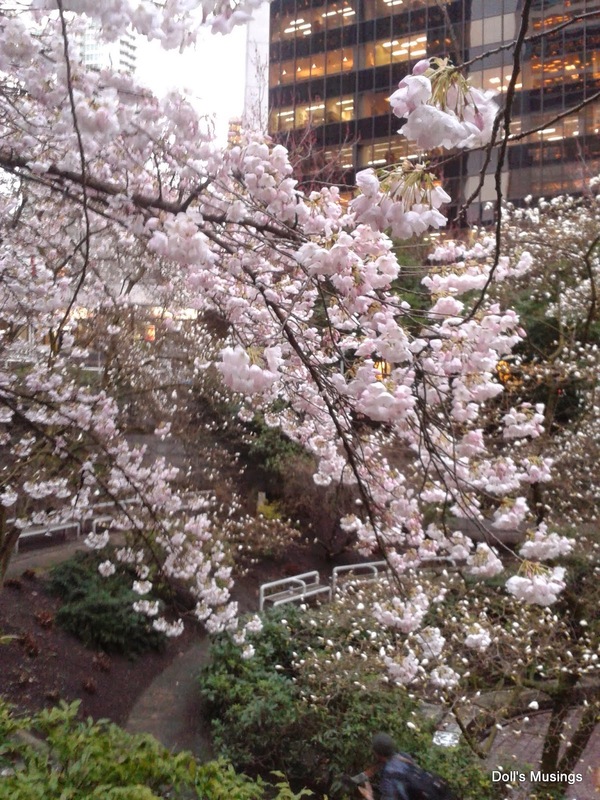 In the Lower Mainland, we are quite blessed with a large number of cherry blossom and magnolia trees. I tried my best to take photos of my favourite trees however, they didn't capture their true beauty. Enjoy a few flower photos. 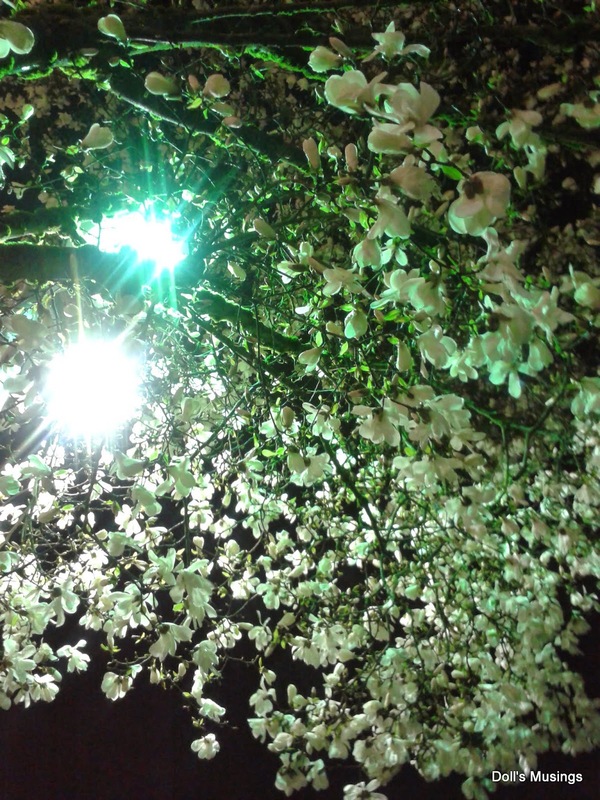 The cherry blossoms were taken at Burrard Station and the Magnolia tree at 22nd skytrain station at night. I'll leave you with some sleepy Titus photos. I resisted taking another Vampire Titus photo. It's so funny how when he sleeps like that how much he looks like a vamp! As for blogger issues, if there are anymore, I might just switch over to Wordpress...but we will see!! 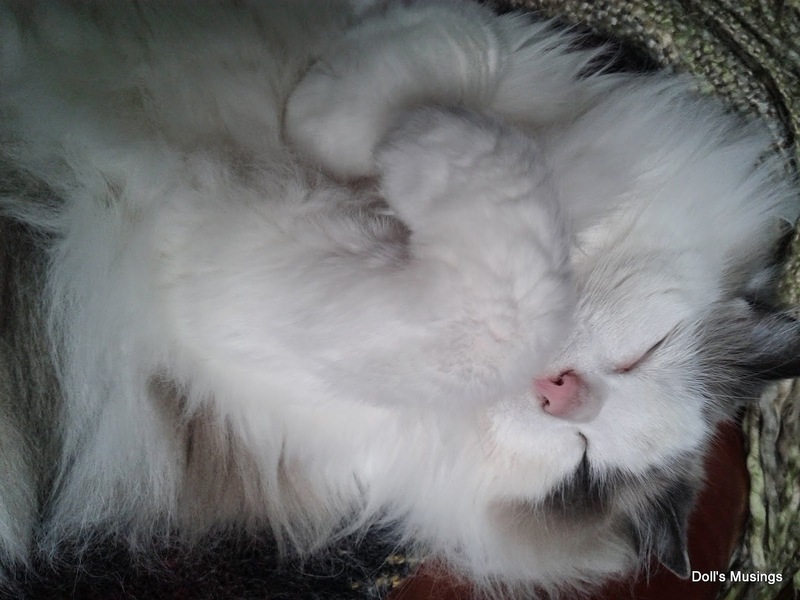 Lovely cherry blossom piccies and furbaby pics, he's adorable. Such a newsy post Anne. That peacock was just amazing! 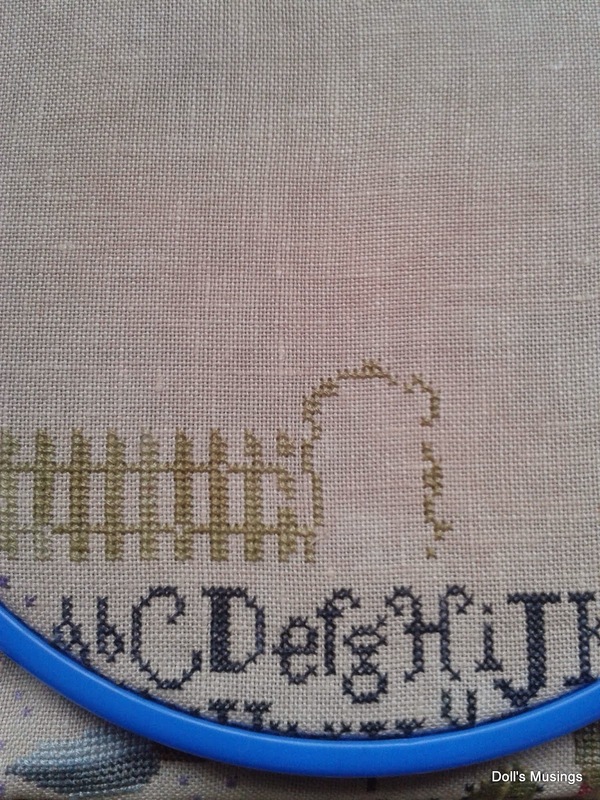 No wonder it took a bit of time to stitch. Now for the quilt, you have exposed my slow quilting to the whole world(just joking) I'm sure your plan will result in a much faster finish. Titus is quite the cat. He seems loaded with personality. Of course, I love the flowers. You took some great shots of them. I especially like the one looking up at the buildings. Really lovely update... I loved it all!! And great spring photo's too.. blossoms are beautiful. Well you sure look like you have gotten lots of stitching done. Every wip is looking beautiful. The peacock looks fabulous....I love him. You have been making progress! Those are lovely pictures. Titus is so beautiful. Everything looks wonderful! Hope your second try at the granny stripe goes better. I'm so longing for any spring flowers at all. Things are still at the very very beginning of any growth at all here. Love magnolias! Titus has blue eyes!!!! So pretty! That's an impressive peacock. Titus is so very bonnie. 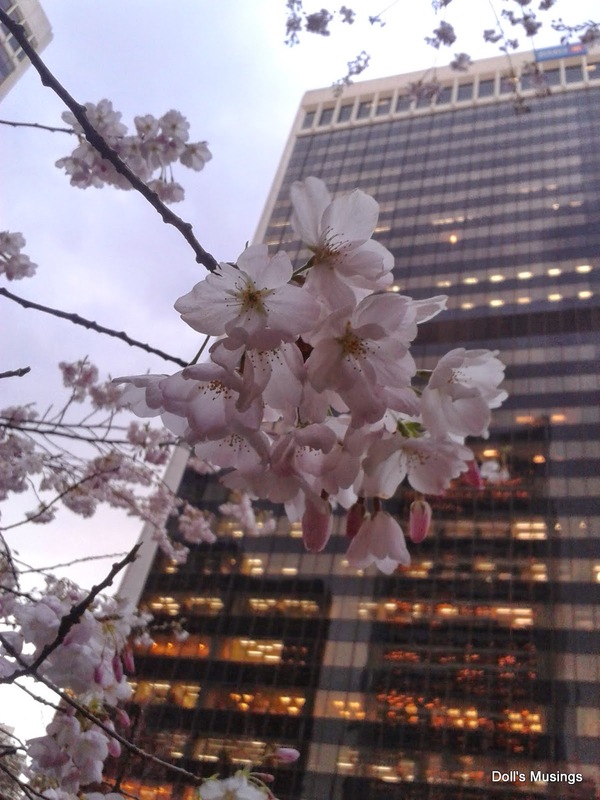 Love your Cherry blossom photos! How beautiful. Look at cute Titus!! He's totally trying to help! 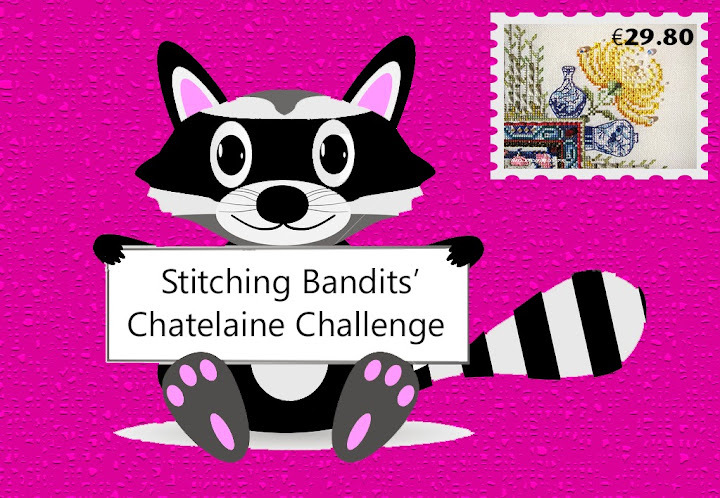 lol Great stitching and crocheting Anne! And the cherry blossoms and magnolias look so pretty in your area! Great stitching and crochet progress. 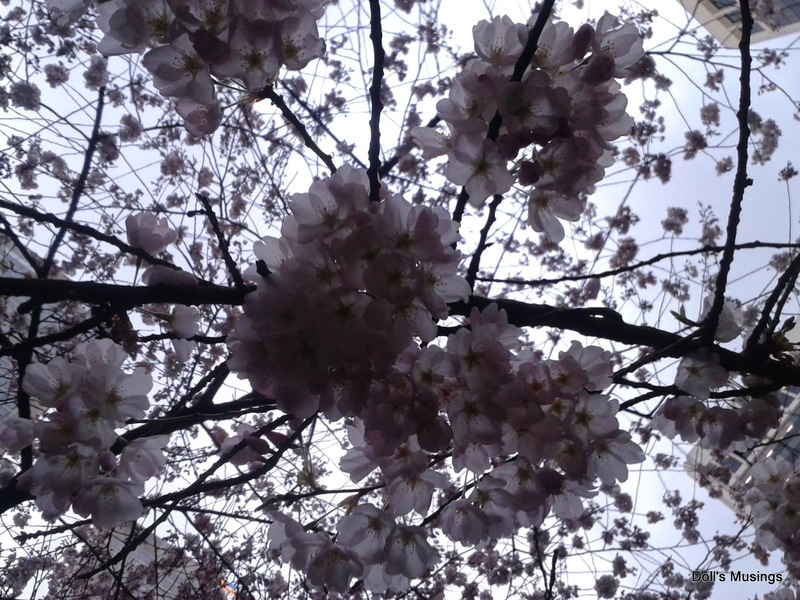 The cherry blossoms are wonderful....I think Spring has forgotten to visit us here in NY....it still feels like winter! your projects look great. The cat made me laugh. What a cutie. Beautiful blossom trees, love your sweet fluffy Titus he looks so cuddly. Great stitching and your quilt and throw over just fab. 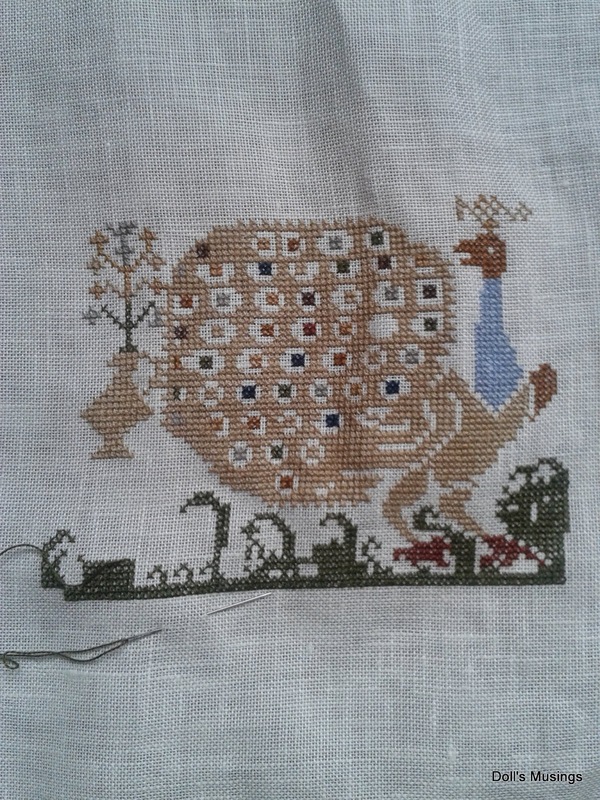 Great stitching progress (yay for finishing the peacock!) Can't wait to see your hand quilting and crochet re-do. Spring lasted maybe three weeks here and it's already summer. Sigh. Lovely Cherry Blossoms...and great work on your projects. Lovely progress on your different projects. The cherry blossoms are just gorgeous, so nice to be outside this time of year. Congratulations on completing the peacock! Love the Titus pictures too, his eyes are sooooo blue! What a great photo of Titus, Anne! He has the prettiest eyes, doesn't he? Pretty peacock on your Magic Garden and your granny blanket is growing nicely, too! How lucky you are to be surrounded by all of those lovely spring blooms. The cherry blossoms are spectacular... Some day I hope to get down to Washington, DC for the cherry blossom festival--I've heard it's amazing. Glad you're enjoying such a pretty spring. Things are warming up here, but there is not a bloom in sight! Wow! Cherry blossoms! Still got snow on the ground here in Ottawa! Made a progress on.it all. And so beautifull. Your granny blanket Is Groningen real beautifull. 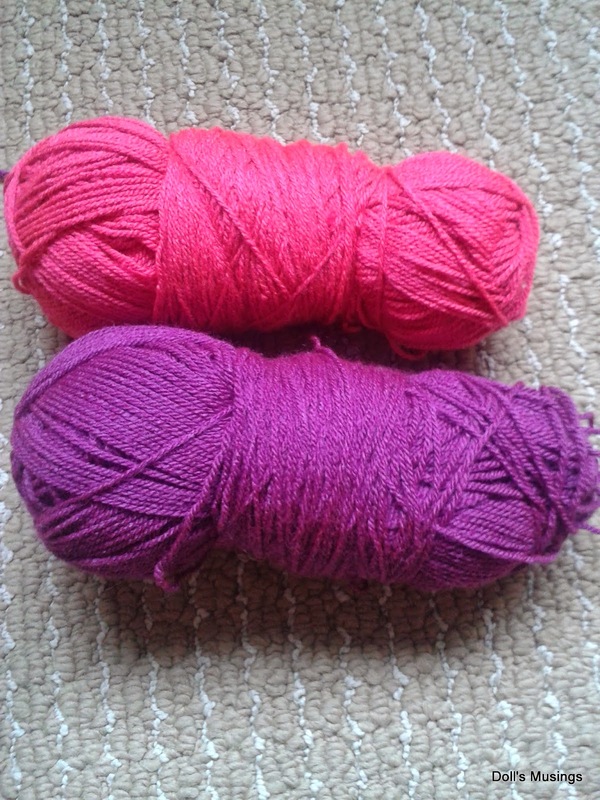 What Will you make with the pink?? The flower pictures are reply awesome!! Really beautifull!!! 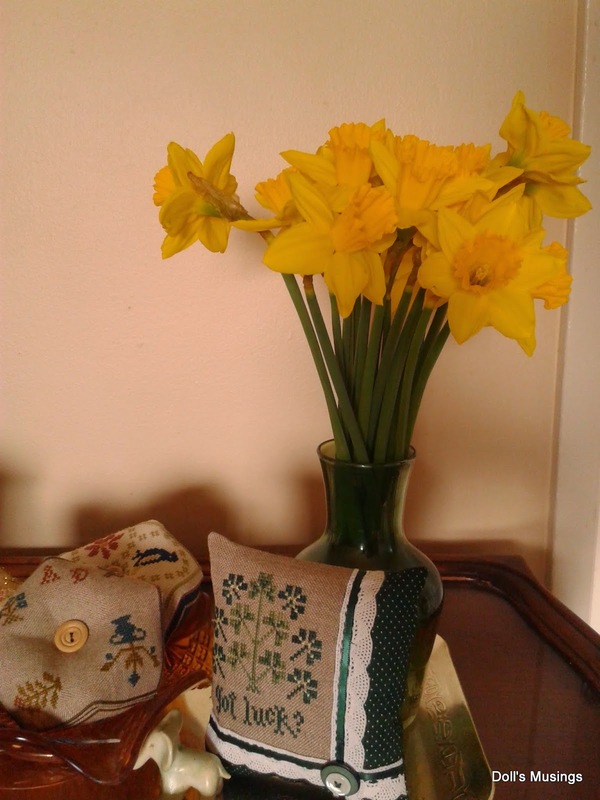 Enjoy spring and your crafting. Blogging can you do always. Also with time between. Enjoy this time of the year!!! And those cherry blossoms... oh my goodness, they are stunning! 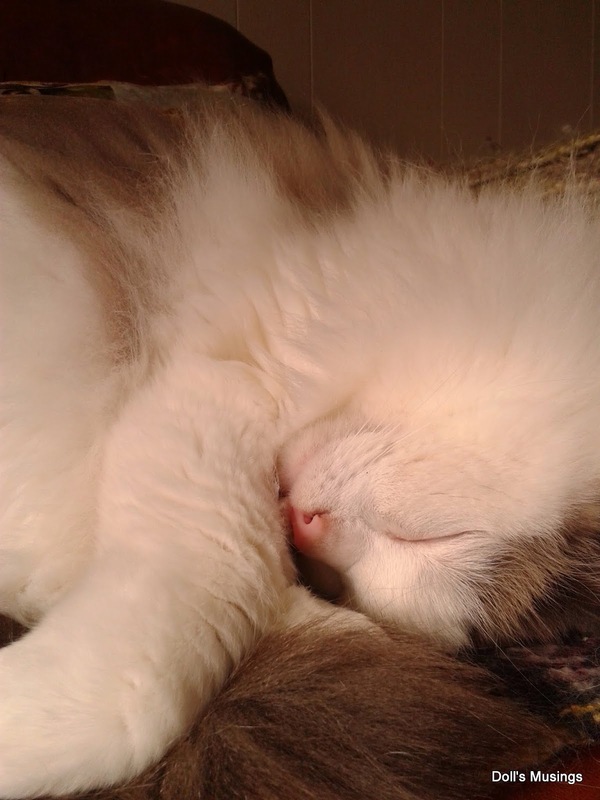 And what better way to finish a post that a pic of a sleeping kitty - that is guaranteed to make me smile at any time! I agree with Annette !! didn't do much ???!!!! such a lovely update here ! can't wait to see what you'll do with them ! 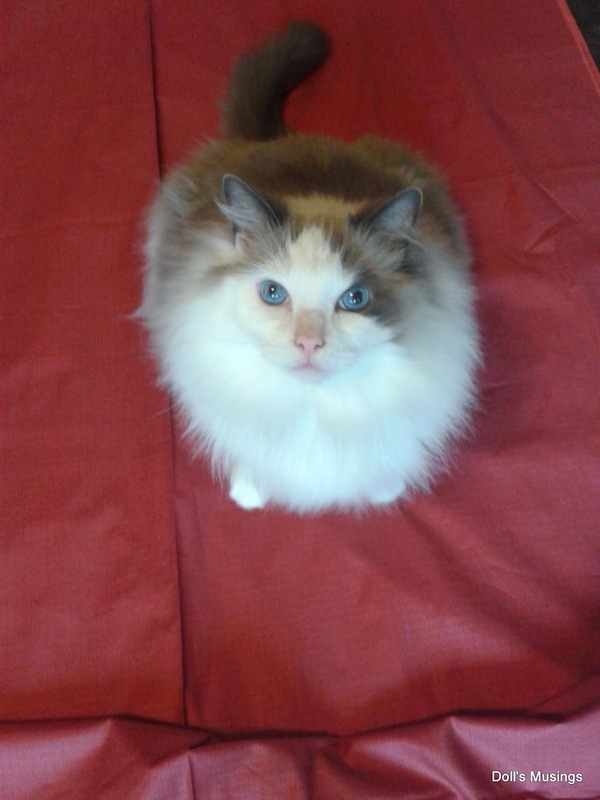 How can something so cute not be helpful! Good luck with restarting the stripe afghan. Nice progress on your stitching. Pretty flowers!! Mine have come up, but no blooms yet. We actually had snow and frost on Monday! You have much progress to show on your WIPs. The blanket is growing and growing and your stitchy WIPs get more and more motives finished. You've been busy I'd say. I love your spring pictures. I appreciate every single sign of spring, every colours that is added by flowers and blooming bushes and trees. And the fact that it's not too hot just adds to the pleasure of feeling spring.